Just an Individual with her very own persepctive of Life. I want to dance and love, and dance again. One day I hope you feel how I feel... you reminded me how painful it was to be rejected. Tears flowing, like a broken sink. Heart sings a downer. Perfect day to start a soul searching journey. Ameen. As defined in street language "hip, cool" is always how I looked at other cultures. Them with varied and vivid colours; gives me chill all over my body. Like there's an electric wave inside me that summons proud. Wishful thinking, "oh how I wish I can be that..this...oh no, maybe that". However as I grew older, I realised that being Malay has its own ameliorate. We are so rich in culture, food and tradition. But..often we forget where we come from. Malays as we call ourselves are not just descendants of the Golden Era Sultanate, we are also those who inhabits the entire Malay Peninsula. No matter how much I say about the goodness of my ethnicity, I don't think anyone could ever truly know and understand why. Like I said, loving and caring for your own culture is very hard because its a full time job. Nonetheless, what fascinates me the most about my race is the traditional ways of Malay Women in their baju kurung. "Sungguh Sopan". Rarely do you see girls today in baju kurung. Real scenario: "eh, kau suka tak pakai baju kurung? ""ala..leceh la, mana suka pakai benda memanaskan badan macam tu. Tak style la pakai baju kurung, Kuno habis..."
Sadly, little do people know that the strength of a Malay Woman lies in her "adab and sopan santun". The way they carry themselves in the nicely fitted and colourful baju kurung, the way they speak to others with total humility and kindness, the way they make homes safe and comfortable for their family, the way they sacrifice themselves to make others happy and... Even from the way they gossip with neighbours to catch up on worldly news (they say...). How I wished the wave of modernization didn't kill the life of traditions. 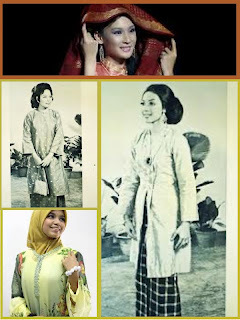 I would love to see mothers dressed in kurung like mothers before them. I would want to be able to go everywhere with my baju kurung and sanggul feeling proud of myself for being a "perempuan melayu". Needless to say, despite viewed as a weak gender - these Malay Women; them with all their kindness and "peradaban" is what makes them mighty and rich. Malay women has smiles that could cure a dying heart, a voice that speaks more angelic than a nightingale and hands like wands creating delicious food. Everyday I pray I would turn into a woman like that - kata mak, "sungguh bersopan santun anak mak". When that day comes, I will be more than proud. Hasil Nukilan Sendiri - Nina Liyana. Note: Collaged picture - myself. She was smiling peacefully. I kissed her, willing her to put her arms around me. She was cold. Less than two hours ago she was hugging me. Her last words, “Go now it is time forIsyak prayers. Bring my jubah for our trip home tomorrow. I love you.” She was my roommate. Oh Mak…. This was our 13th Umrah. All eight siblings were there. Mak was coughing a lot though. She was in a wheelchair as her knees hurt but her physician said she was fit to travel. Our Umrah went beautifully. Mak was happy and shopped like there was no tomorrow. Aftersubuh, on the day we were leaving I noticed blood in the bathroom. She seemed unaware. We took her for check-up. The doctor said she must be hospitalised. Mak was upset. “I want to go home!” she whispered. I stayed by Mak’s bedside as they examined and prodded her. What are u doing? Suddenly, everything went chaotic. “Get her out!” shouted one of the doctors. I was kicked out. They swarmed around Mak. Her heart had stopped. Mak revived but was not allowed to travel, much to her chagrin. The family came and she looked more cheerful even with the oxygen mask on. I was the last to leave. “I want to go home,” she whispered tearfully. Tomorrow Mak I promise. “Go now it is time for Isyak prayers…Mak died after I left but we knew only two hours later as we were in the mosque doing thesembahyang hajat for her recovery. Deja vu. Flashback 14 years earlier. Same hospital. My father hugging me. I was the last to leave, “Come back soon. Take care of your mother. I love you,” he said as I cried in his arms. Bapak had pneumonia and was hospitalised. Those were his last words. Mak was devastated. She cried with his shirt in her face when she thought we were not looking. Arrangements were made for Mak’s last rites the next day. Her six daughters bathed and cleaned her. Mak had never been handled with such tender loving care. The prayer for the dead reverberated in Masjidil Haram. Mak was buried in the Mecca cemetery. My two brothers carried her lovingly to her grave. We left for Kuching that night. Mak gave us laughter. She did not do anything earth shattering. She was happy to be a wife, mother and to feed everyone. She was obsessed with food and was an incorrigible shopaholic. Mak had an unbelievable zest for living. She didn’t go to school but she was a fast learner. By merely observing Mak could cook, sew, create intricate jewellery, play the accordion, piano and drums, dance the tango and quickstep, and even juggle, yes like a clown. And she loved to mimick. People felt good around her as she was very warm and entertaining. Mak was a jack of all trades and master of none. Her attitude was as long as you are alive, live! If you make mistakes, laugh at yourself and at others if it makes you feel better. Nobody is perfect, not even the prophets. Mak was good looking. She was called ugly once, by Bapak. He was in a coma for a month and when he opened his eyes and saw Mak he growled in English, “Get this ugly woman out!” We never told her. Later he told me he was in this beautiful place, surrounded by gorgeous women until he heard my mother calling him non-stop. My mother Puan Sri Datin Amar Nong Othman was born in Kuching, Sarawak on June 15, 1918. She passed away in Mecca on August 4, 1999. My father passed away on August 26, 1985, whilst performing the Haj. Abang Marzuki Nor was born in Sibu on May 18, 1913. He met my mother in Kuching when he joined the police force as an Inspector. It was love at first sight. “She was beautiful,” my father said. “Unfortunately none of you got her looks!” My parents were married on July 3, 1936. It was the start of her life as a member of the Obedient Wives Club. There were 10 of us in the family, four boys and six girls. The first two boys, Nor Hashimand Nor Zainal Abidin passed away when they were toddlers. Then along came Norlia, followed in quick succession by Osman, Normah, Norjanah, Khalid, Noor Asmara (me! ),Nordiana and Norbaini. Now there are 80 of us in the Marzuki clan. My father’s journal recorded the Japanese occupation when he was arrested and tortured, and how Mak risked her life, peeping through a window with baby Osman to give him courage. Her second separation from my father was in 1954. He was sent to Ryton-on-Dunsmore in the Midlands of England. My mother was more terrified of Bapak flying (BOAC) than being left alone with six young brats. Bapak had a jolly time in between studying, driving withfriends to Scotland, Ireland, Paris and Switzerland, while she slaved at home, pinching us blue black. We grew up in a happy household. My parents were very loving. None of us ever heard them fight. My mother would support him in everything. She never flinched as we were belted or caned. We learned from an early age not to appeal. It was pointless. They would back each other to the death – ours! “Mak was a fantastic cook. She just threw in everything and it was perfect. Everything was in her head. She was also fashionable and loved to design and sew, even making her own jewellery. Both of them used to party! But Mak found the time to help Bapak with sideincome - cooking for others and being a “mak andam” during weekends. She loved to frighten us with horror stories so we would go to bed early, piling onto their bed till they came home.” Piling on the bed became a Marzuki trait. We had our family pow-wow on their bed until they passed away. It made us very close. My late brother Osman (he passed away in 2006) said Mak kept the family together. Success could only be achieved with unity in the family she emphasised, “and take care of each other when I am no longer around”. We do. Said Normah, “Mak would make us cook! Whoever came must eat! She got angry if we grumbled and even whacked us. “You will never go hungry if you share with others!” she scolded. She was generous. During our Haj pilgrimage Mak even cooked a storm for a bacadoa for Bapak’s khatam. We were too scared to express any negative feelings in case God punished us. “I loved her very much,” said Norbaini, the youngest. ”When bapak died we spoilt her. I would do anything for her. Her mourning did not last long as she went back to cooking and shopping! For Chinese New Year, Christmas and Deepavali, she baked hundreds of cakes for her friends, including the fishmongers and tailors. Mak was not discriminating. She was a spendthrift. She spent generously on the less fortunate which I delivered every Hari Raya. I am still doing it. Mak still makes me laugh now. She was funny and caring. I miss her everyday”. Mak was flexible. Our singing Christmas tree was a great joy to her as it brought happiness to her grandchildren. I once voiced my irritation with the singing and she retorted, “The tree’s not killing you so why be stupid!” This was Mak’s way of telling us to be tolerant of every race and religion. The passing of anyone you love is painful. But I believe they continue to live within us. Mak…I know you are still with us. Thank you, we love you. Trading up or trading down.. something that is a matter of making that perfect decisions. However how would one know which directions to move towards? Life as it is, is very volatile. The financial market imitates our life perfectly. Go short peeps, then long.. then nothing at all. Pure senile to me, I tell you. I miss home. Total randomness today. Bye! Exams; I think is the most often obstacle people in general face. Today was very challenging however I am still hopeful it is good enough for a good grade. I am hopeful, very. Ethics and Practice - Final Countdown. Protestant Christianity. Religious views on economics - fundamentals. Moreover... the Ideologies of Adam Smith, Schumacher and Tekkel. These are amongst the few topics discussed in our last ethics class today. I don't know why I'm not enthusiastic (at all) about it? I've lost touch of study happiness. Memory booster and all other good things please.